Pier Watch Villas lives up to its name as a North Myrtle Beach vacation destination that offers front row views of the neighboring fishing pier. Its a charming vacation condo complex. 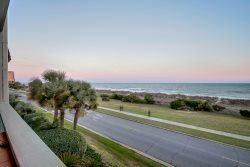 Brimming with luxury accommodations, Pier Watch Villas is a comfortable North Myrtle Beach destination. The oceanfront swimming pool sparkles in the sunlight and the hot tub invites you to relax in it a few minutes each day. A second pool and sun deck are across the street for guests to enjoy. Plus the Atlantic Ocean and the gorgeous white sandy beaches border the entire east side of the resort.